If you are interested in hand quilting, and I hope that you are, I recommend checking out the Celebrate Hand Quilting Facebook group. This Facebook group was designed for quilters who (mostly) hand quilt their own quilts. We also have a blog at http://celebratehandquilting.blogspot.com/ . We would love for you to share a link to the Facebook group and blog with your handquilting friends. Please do not post sales or promotional information to this group. This group is not designed for you to market quilting products and advertising is NOT allowed without permission from the group administrator (Caron Mosey). So unlike many groups, we have no advertising! No promotions!…only quilting!! If you are interested in Joining the group here is the link https://www.facebook.com/groups/handquilting/ It is a closed group so request an invite from Caron when you get there . Members of the group share pictures of their quilts, and quilts in progress, share tips on all aspects of hand quilting, supplies, techniques, books, patterns, etc. It is a great support for beginners, and advanced quilters as well. 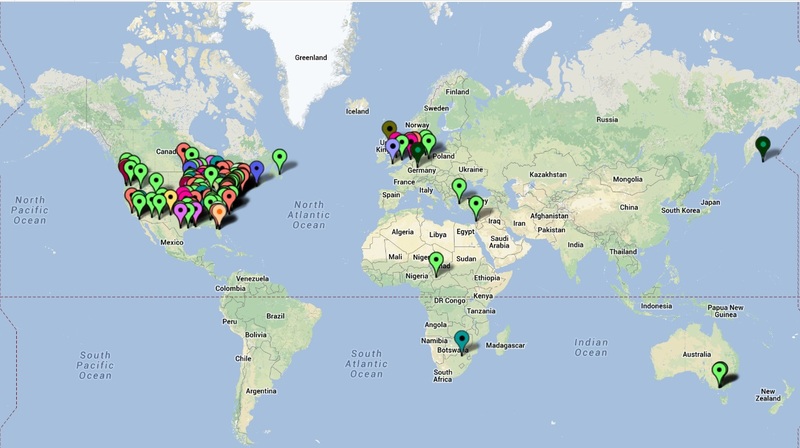 we have over 900 members across the world so new pins will continue to be added to this map. Thank you, Tim, for sharing this. I am a hand quilter and also do a lot of hand piecing and hand appliqué. I needed this push to stop me from turning over a couple of my quilt tops to a machine quilter. I was thinking about taking the “plunge”, but really find it hard to turn over that part of the creative process. I feel like once I give it to someone else to quilt, it’s no longer my quilt. I can’t make changes to the quilting once it’s started, which I do a lot with my hand quilting (usually adding a lot more quilting). I may never get all my tops hand quilted, but at least they will be MY quilts when I’m done. My thought exactly!! I cant imagine a quilt being mine if it was quilted by someone else….hand quilting takes time….but the reward is worth it!! I remember telling you about Facebook, and urging you to join. Glad it’s worked out so well!! I’ve only just joined facebook too so I’m glad you reminded me about the celebrate hand quilting facebook page. Than you for being the force behind the group!! I get so excited when I see a new member who says that they thought they were the only hand quilter left! power in numbers!! woohoo! it worked! I’m a member! Thanks. Thx for your generosity with info & contacts @ quilting. It’s a great help for those of us who are “solitaries” – quilting without a network of like minded people nearby. You are both amazingly talented and supremely thoughtful & I’m soooo glad I found you online, Tim. you are welcome Joan!….I was a “solitaire” as well for a long time, and I know how much more enjoyable it is when you have some quilting company! I wish I had your energy. I love hand quilting, but hate basting so my tops are just sitting in the closet. Love your dog! I have a little ten year old Fox Terrier named Maggie and she is so sweet, smart, and funny. I also hate to baste….I think that is why I use safety pins…and not very many! Give Maggie a pat and a scratch from me and Teddy! I am a “former” hand quilter who strayed from my roots and have struggled with machine quilting. I have decided to return to hand quilting but thought I would be out here all on my own. So glad to find your blog and the Facebook group!